Much of the land of the Goldfields-Esperance Region of Western Australia is arid and inhospitable. Only the hardiest plants and animals take up residence. The aged, salt-ridden soils are almost entirely infertile, and there are no flowing rivers to breath life to the area. But it is here, roughly 40 kilometers north of the town of Kalgoorlie, that many men and women venture, hoping -- ironically -- to live a life of luxury. By digging 35 meters below the spartan surface, they might just find the key to unlocking such an existence, a shiny, soft, and lustrous metal: gold. Approximately 30% of the world's demonstrably accessible gold reserves lie buried in the region. The notoriety beckons more than just gold-lusting prospectors; it also brings curiosity-stricken scientists. 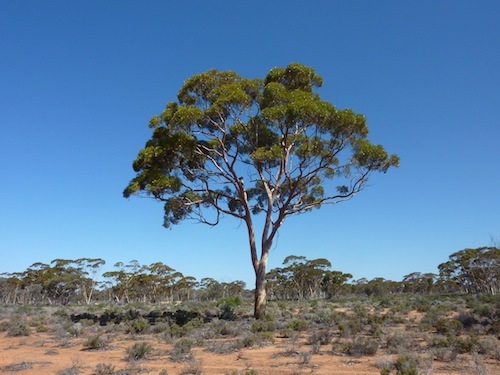 Recently, a team of researchers visited the area and turned up an interesting finding: Gold is growing on eucalyptus trees. "We show the first evidence of particulate gold within natural specimens of living biological tissue," the researchers report in Nature Communications. Interestingly, the team found that gold is being released from the trees through falling leaves, begetting quite a compelling conclusion: In Western Australia, gold is literally falling from trees (although in admittedly microscopic amounts)! One couldn't simply rake up the leaves and become rich, but those leaves may very well indicate the presence of more tangible stores of gold buried below. *Post updated 10/23 to add clarity and information. Source: Lintern, M. et al. Natural gold particles in Eucalyptus leaves and their relevance to exploration for buried gold deposits. Nat. Commun. 4:2614 doi: 10.1038/ncomms3614 (2013).